There’s quite a choice of heaters for a greenhouse. Before considering a greenhouse heating, don’t forget to insulate your greenhouse or your costs will spiral and you may well find your greenhouse heater does not cope on the coldest of nights. The traditional paraffin greenhouse heater had a number of advantages but now suffer from the problem that obtaining the fuel at reasonable cost has become very difficult. At one time every town had ironmongers and petrol stations with a tank of paraffin that was sold cheaply as many people had paraffin heaters in the home. Now the best many of us can find is paraffin in 5 litre packs at a high cost. If you have a source of cheap paraffin (such as an allotment association shop supplying from a bulk tank) then well worth buying. Reservoirs will last over a day on many models so they don’t require too much attention. Self-contained, they don’t require any electric supply. They are always on and manually controlled so can be burning away when their heat is not needed and wasting fuel. 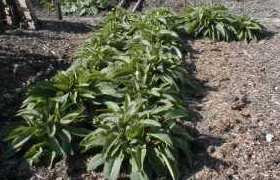 They output water vapour, which can encourage mould in the greenhouse. 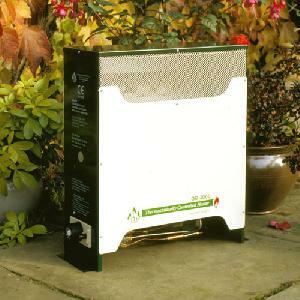 These are great if you have a power supply to your greenhouse and have some distinct advantages over paraffin heaters. Because they can be thermostatically controlled, heat is delivered only when required so running costs need not be as high. 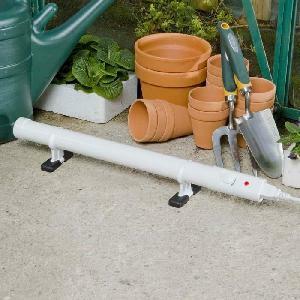 If you don’t have mains power to your greenhouse then the cost of laying it on can be high. You’ll need to connect it via an RCB to cut the power in case of a short and use armoured cable which is pricey but most expensive is the legal requirement to use a qualified electrician for the installation. 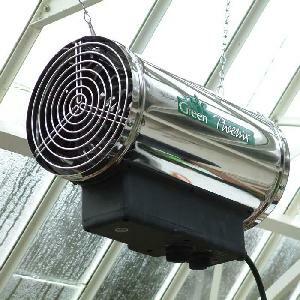 A fan heater has the benefit of not just warming the greenhouse but also moving the air around avoiding cold spots and the fungal problems associated with stale air. For low-level background heat, cheap, low-output tubular heaters can be bought for reasonable cost and even connected via a thermostat. I’ve actually constructed a small heater by connecting a 100W light bulb encased in an old tin with holes made in it and a frost thermostat picked up for 50p from a car boot sale. Doesn’t really need more knowledge than wiring a plug. The same thermostat could cope with a 3Kw heater. Do ensure you get a 240v thermostat not a 12v. These are run from propane bottles. Thermostatic controls and relatively low cost of gas can make these an economical heating solution but the savings against electricity are marginal nowadays. They produce CO2 which will help plant growth but they also produce water vapour so it’s important to keep the greenhouse well ventilated by combining roof vents with louvre windows. I have seen a double glazed greenhouse heated with underfloor piping and fan-assisted radiators. The heat came from a normal mains gas central heating border. Wonderful system, but very expensive to install. The running costs were quite modest though. 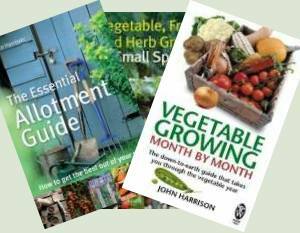 Conclusion – What Heater to Buy for Your Greenhouse? 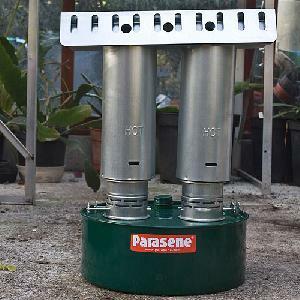 For a greenhouse without mains power, paraffin greenhouse heaters are the way to go if you have a cheap supply of fuel. A big ‘if’ unfortunately. Otherwise propane gas is a good solution. If you have electricity available a thermostatically controlled fan heater is probably the best solution to go for. Greenhouses in High Winds – Protect and Survive!